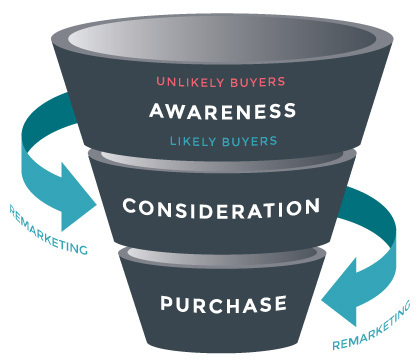 Your job as a marketer is to keep prospects moving through each stage of the conversion funnel, prevent drop-off and encourage them to complete their purchase by aligning your marketing strategies with each level of purchase intent. This is about attracting interest by generating a desire or creating a need for your product or service. Careful research of keyword and keyword intent, followed by intelligent broad keyword bidding, can place your ads in appropriate searches for the initial ‘query-level’ intent. If your site has a blog, or informational pages, then these – rather than high intent landing pages – are better to direct consumers to for this type of campaign. (Search campaigns are also an effective strategy in the mid and lower funnels – see below). The GDN is a collection of websites, including specific Google websites like Google Finance, Gmail, Blogger, and YouTube, that show AdWords ads. Try placing regular and static GIFs using broad keyword and topical targeting (as well as strong branding) to build desire. Rich media ad formats with strong and consistent branding are great for initial exposure, for example, pop-out catalogues, static pop-outs, or video. Arrival on your homepage demonstrates an initial interest in your brand. With use of remarketing cookies, visitors that have gone no further can be targeted with branded ads to raise their awareness of the scope and variety of products available through your site. With many of the social media platforms now offering ad options, you can segment by demographic to tighten the focus of specific ads, delivering a more individualised ad experience. Social media paid ads also offer the benefit of reactive potential – where in addition to targeting users on stated, permanent interests, tweet topics or post content can be tracked to deliver pertinent, highly relevant ads to social media consumers. This is for those consumers that showed an initial interest, but for whatever reason were drawn away from the page. The dynamic remarketing approach aims to get products in front of the consumer that they have already viewed, as well as other similar products. By visiting a product page they have acknowledged a need – this kind of ad is to show them various ways of fulfilling that need with the intention of drawing them back in. This variety of remarketing aims to re-engage those who have previously shown a consistent high engagement with your products or services. By showing them similar items, you can capitalise on an already high level of interest. Offer consumers who have already made a purchase linked products and services, for example, offering accessories for electronic or fashion purchases, or service extensions and upselling packages. This method seeks to capitalise on a consumers previous enjoyment of your offering and increase their attachment to your brand for subsidiary or followup purchases. Search campaigns at the mid-funnel level will focus on a suitable mid-level intention – such as the search for product descriptions, comparisons and reviews. Using keyword strategies which target search terms at this level of the buyer’s journey, the aim is to convince consumers that not only is the product or service they are researching is the right one, but that they should be buying it from you! Via Google Shopping, consumers with an easily defined, high intention to purchase can be targeted specifically with image and promotion based ads, which seeks to capitalise on their high intent searches. In addition to this, if you have ensured your brand has been raising awareness at all other stages of the journey, the trust and awareness levels at this stage are likely to be high. It’s safe to assume at this stage that the consumer is ready to make a purchase, but that there is something holding them back from clicking that final button leading to conversion. At the point of leaving the basket there can be a number of factors – from time issues, to payment method, price or delivery method. Depending on where they abandoned, seek to offer quick fixes, offers and alternatives to enable them to make the purchase both sides now want to make. Search campaigns in the lower funnel category are all about the push to purchase. By bidding on high purchase intent keywords, however, you are likely to face stiff competition. It is your responsibility for search campaign ads at this stage to really heighten the desirability of your brand over the others that will likely be competing for their attention. Provided you have been nurturing the buyer’s journey at the other funnel levels you will have developed a level of trust and brand awareness that will put you ahead, but now is the time to push promotions, discounts and other payment options which will really elevate your brand over the competition. A well-executed keyword strategy here is worth the extra cost entailed in the bidding process, because at this stage you will be competing on the quality of your ads and merchandise for a far higher percentage chance of conversion. This primarily targets existing converters, seeking to capture return custom through upselling and accessories. By tailoring ads to previous purchases, it is possible to predict needs, so that sunglasses purchases could lead to remarketing ads for other holiday themed accessories, while those taking out a free trial subscription can be targeted for upgrade to premium packages, using a previous positive interaction to drive repeat custom. Want to find out more about paid search or any other facet of search marketing? Why not check out our other blogs, resources or infographics. Or to see how Click Consult can help your brand achieve the PPC results it deserves, contact us today.